Students will learn about shading and value. Students will learn basic techniques of watercolor painting. Arrange bottles on a desk or table so they can be seen clearly by all students. (You might need to set up several “stations” around the classroom). After students have looked at the bottles with no light source, add a light source (small desk lamp) coming from the side and discuss with students how highlights and shadows are made and how they affect the way the bottles look. Demonstrate the way different amounts of water can be used with watercolor to show different values. Students then draw the outlines of 3 to 6 bottles on the white paper. 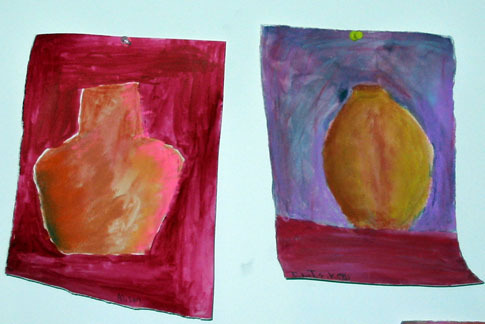 Using light wash, encourage students to paint one bottle with one color of water paint. In the center section of the bottle, they should paint a darker value. On the shadowed side, they should paint the darkest value. On the light source side, they should use less paint. Students should be encouraged to use a wet brush to blend the three values together. Optional: Students can use chalk pastels to add additional details to the artwork (as shown in examples). Optional: Once they have finished, cut out each of their bottle paintings and glue them onto the background paper for display.